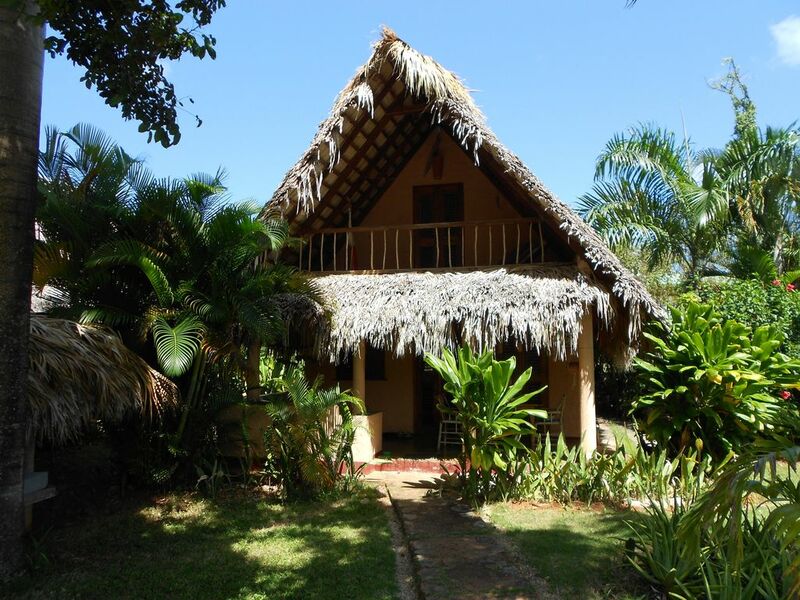 The Casa de tres Amigos is a palm-covered house set in a beautifully landscaped garden. The house is located in the second row to the sea and is located at the end of a side street near the village center of Las Galeras. The Casa de tres Amigos is suitable for 2-4 persons and has a kitchen with a large fridge incl. Freezer and gas stove. The house also has Wi-Fi, 220 volt electricity and hot water. Each rental includes towels, linen and weekly cleaning. Upstairs is the bedroom with direct access to the balcony. The bed has a size of 1.80 x 2.00 meters and is equipped with a mosquito net. The ceiling fan always provides fresh draft. In the basement there is the bathroom with hot water shower and toilet. In the living area there are 2 sofas (each 0.80 x 2.00 meters), which can be used as sofa beds. The covered terrace is the actual living area, which consists of two sofas and a dining area. The outdoor shower made of natural stone, the brick barbecue and the palm-covered suspended bed in the beautiful garden, pull you out again and again. The entire house with its heavenly garden, leaves nothing to be desired.